Three professors of IIT Kharagpur colluded in a Rs. 28.7 Crore scam under the pretext of developing a software named COALNET for Coal India Ltd.Till date no action has been taken on them in spite of letter from CBI to Director of IIT KGP to levy major penalty against two of the professors and minor penalty against the third professor. All the 3 professors continue to enjoy privileges at IIT Kharagpur with one of them being promoted to the post of Dean. WikiLeaks is under attack by the big financial services companies , but there are still ways you can beat them. As a result of exposing U.S. embassies from around the world, five major US financial institutions, VISA, MasterCard, PayPal, Western Union and the Bank of America, have tried to economically strangle WikiLeaks The attack has blocked over 95% of our donations, costing tens of millions of dollars in lost revenue. The attack is entirely political. In fact, in the only formal review to occur, the US Treasury found that there were no lawful grounds to add WikiLeaks to financial blockade . 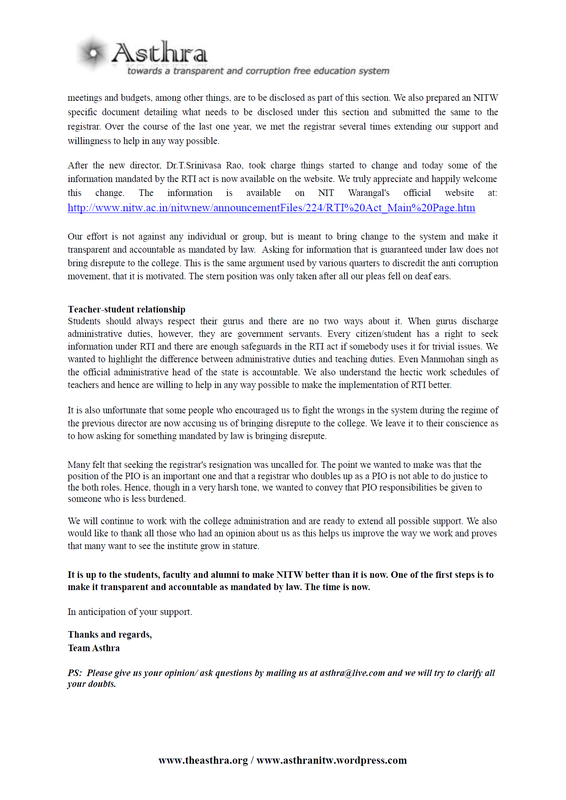 Your donations are vital to pay for our fight against this and other kinds of censorship, for Wikileaks’ projects, staff, servers and protective infrastructure. We are entirely supported by the general public. To confirm the correctness for larger donations or to report any difficulties please call +44 7554 181 066 . This number is only able to answer calls about donating. With our partners Fundrazr you can use a Credit Card to donate to the WikiLeaks and Julian Assange Defence Fund. This fund was established to cover the legal defence fees of Julian Assange and WikiLeaks staff. Derek Rothera & Company is appointed to administer this Fund. The trust is audited and can only spend funds on Julian Assange & other WikiLeaks staff’s legal defense. The terms of the tust and its trustees can be found here. It is governed by the laws of the United Kingdom. You can help spread the word by purchasing WikiLeaks-branded T-Shirts, hoodies and other gifts at the only shop that sells official WikiLeaks merchandise. Also if for some reason you cannot send us money using the regular donation system this is a way to support us: profits go to WikiLeaks. If you don’t have a PayPal account you can donate directly using your credit or debit card by clicking on the ‘Give’ button below and choose ‘buy as guest’ option. Derek Rothera & Company is appointed to administer this Fund, which has been established to receive donations that will be used to cover the legal defence fees of Julian Assange and WikiLeaks staff. Foundation: This support is tax deductible in Germany! You may be able to donate by using you mobile/cell phone (depending on your country). Please click on the corresponding logo. The administration of NIT Warangal is yet to take corrective action over serious shortcomings and irregularities highlighted by CAG in its audit report submitted this September on Performance of NIsT from the period 2005 to 2010. The response of the administration to this report remains to be seen. It is observed that the administration is busy in playing a blame game with the Non teaching staff rather than exploring ways to overcome the shortcomings in the smooth functioning of the institute. Most issues raised by Team Asthra were pointed to the ‘inefficiency and shortage of Non Teaching staff’. But the findings of CAG (Comptroller and Auditor General) tell a different story. The CAG report says there were an excess of 13.3 percent Non-Teaching staff (477 Non teaching staff are employed over 421 as per norms). It looks like the non implementation of RTI act in letter and spirit can be attributed to lack of interest in the administration about tranparency and accountability in its working. The CAG report observes that massive works worth 6.23 crores were carried out during the years 2008-09 and 2009-10 without obtaining recommendations of Building and Works Committee (BWC), that is responsible for all major construction works after obtaining the necessary administrative approval and sanction of expenditure from Board of Governors (BOGs). This points to a serious procedural lapse and abuse of power that can lead to corruption. The NIT Warangal administration also seems to be taking in more students than approved. The report observed that 20 students in Electronics and Communication Engineering, 2 students in Mechanical Engineering and 2 students in Chemical Engineering were admitted in excess and against the norms (The administration did not provide data for Civil Engineering and Computer science courses). The biggest shortcoming and a matter of great concern for NIT Warangal is the non-accreditation of undergraduate Biotechnology course and 16 other post graduate courses by National Board of Accreditation(NBA). Many local engineering colleges in Hyderabad have a A+ star rating for their Biotechnology course from the NBA. While faculty shortage of 209 members is a major issue, in-house training for the current faculty also did not take place for the last 5 years. Interestingly NIT Warangal which boasts of placements is not the best among the NIsT when the average (B.Tech + M.Tech) of the placements is taken. Also the institute does not have sufficient number of computers and there is a shortage of 196 computers which would cater needs of 784 students. The only parameter on which NIT Warangal stood ahead of other NIsT was the hostel facility however poor class room facilities and lack of 38 lecture halls (Lecture Hall and Class room are different) continue to haunt. There is urgent need for revitalizing academics at NIT Warangal. Transparency and Accountability in the governance should be given the utmost priority in this time of crisis. The task of turning this around lies upon the senate which is responsible for the maintenance of standards of instruction, education and examination in the Institute and the vision of the Director who shall ride the chariot. 1. That the applicant needs to give reasons for seeking information. 2. The PIO can reject the information under sec 8 if he thinks the reasons are not adequate in his opinion. The proposed amendments bill is here. 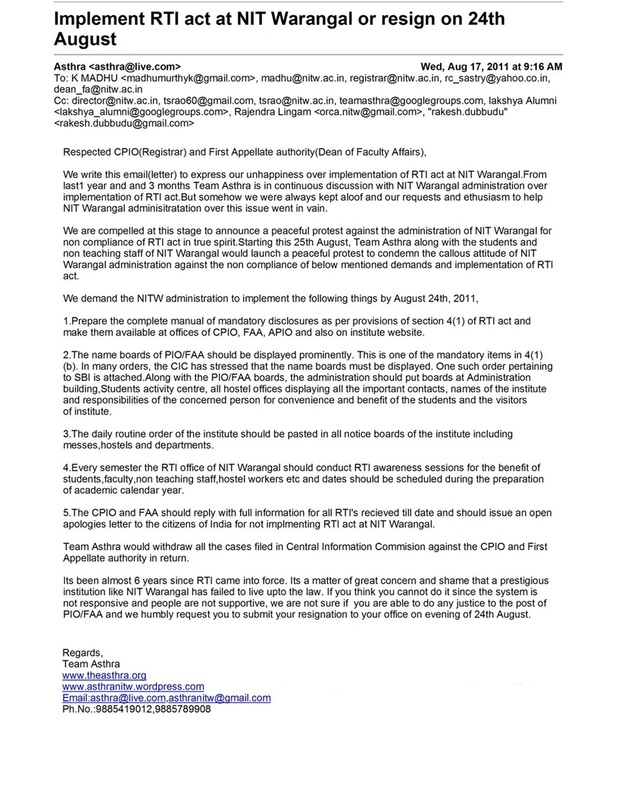 We received a reply to our RTI filed on NIT Director’s selection criteria. This was the second RTI which we filed on this line and our previous RTI too was the similar one. The second RTI had to be filed as the second appeal filed with the CIC is yet to come for hearing. The link to the information received from ministry has been attached in the below link and is also available in “Our Work” tab of this blog. We sought various information related to the Director’s selection, right from applications received for the advertisement to file noting of various meetings held in the due process for selection. The reply received from ministry indicates that there was a purposeful delay and illegitimate use of various sections of RTI to provide the information sought within time. 1. The first paragraph of the reply contradicts ministry’s own statement on “Third party” and provides all contact information in a neatly tabulated sheet when we have asked for the copies of the application filed. 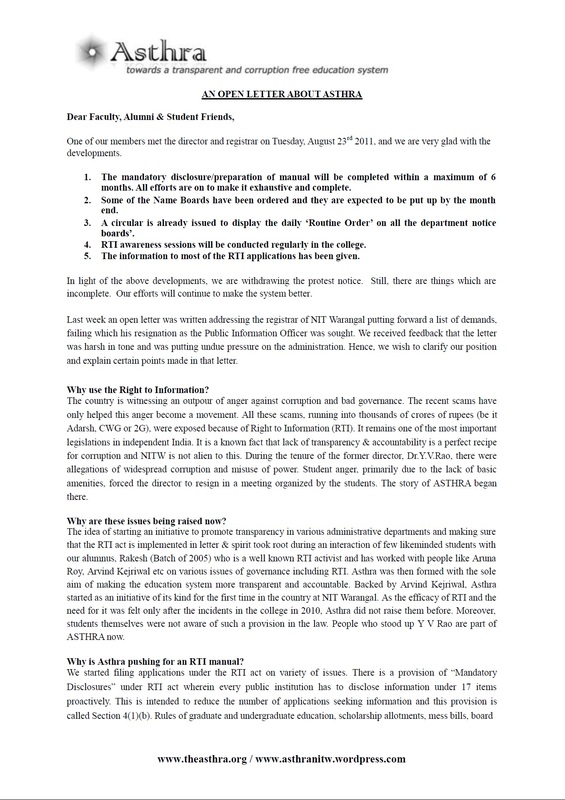 The ministry makes a baseless statement, “due to tremendous pressure of work, it has not been possible for the NIT division to seek the opinion for furnishing copies of their personal details/applications.” The statement itself is inherent in its character for non compliance of the act and the double talk of the ministry. If the personal details form “Third party” data, why did the CPIO furnish all personal details in a separately prepared document and send it. Didn’t the CPIO know that he had to contact all the 147 applicants before disclosing their personal details? When all the personal contact information related to applicant was provided, how is it that the rest of information provided by applicant in the application a third party information? The sanity levels of CPIO need to be questioned? 2. The names of persons who applied for the post have been given under personal details and recommendations were highlighted along with the name who proposed them. 3. The list of committee members is also given. The interesting point to be noted is that the Directors of Institutes which are on par with few NIT’s are involved in selecting the directors and it is like ,” You select my friend I will select yours”. 4. The biggest flaw in the selection process comes here. No evaluation is done in short listing the 46 candidates from 147 applicants in first round and final short listing after interview. 5. The committee has listed 4 points for selection criteria and has relaxed norms to include few poodles in the final list who recently completed their terms at NIT’s. 6. The ministry refuses to disclose the vital information related to selection process quoting that the selection process has not yet been completed.